Around a year ago, I saw Ariadne auf Naxos at the Met, a performance that, while not bad, was mostly worth seeing for Nina Stemme’s powerful Ariadne. The city might have changed in the meantime, but the Ariadne has not. One Nina Stemme as Ariadne in the midst of much mediocrity, coming right up… this time courtesy of the Wiener Staatsoper. Perhaps the large number of debuts kept everyone on their toes, but this was tidy and engaged, as Staatsoper rep shows go. But other than La Stemme, there’s nothing I will remember about it. You may have seen Filippo Sanjust’s production on this 1978 DVD. As it is today, it’s fine if dull, attractive but neither witty nor transcendent. The Prologue set is the hideous desert island set seen from the back, and it’s on the cavernous side for such intimate music. The blocking was not bad, but compared to Harry Kupfer’s weird Theater an der Wien production of last October it lacked humor and detail. The lighting is crepuscular, and disconcertingly dark. The mood seems to call for something brighter. 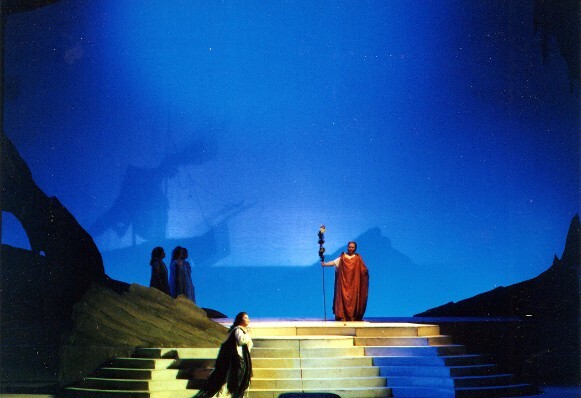 The Opera takes place on an elegant Greek amphitheater-style desert island. If we want to be literal, I can point out that the libretto makes it clear that the Richest Man in Vienna does not have a private theater like the one shown here. Just saying that these productions that are seen as ultra-traditional take liberties with the letter of the libretto too. Conductor Michel Güttler, a late substitute for ailing Jeffrey Tate, was not debuting. But there were issues of coordination, balance, a lack of differentiation, and the whole thing was flat. Nina Stemme sang Ariadne with powerful, beautiful tone (a little heavy on the vibrato), including wonderful low notes. And she is a fantastic actress, strangely making Ariadne into the only character I cared about in the entire performance (as you can guess, I usually find her a bore). But this time around I doubted the suitability of this role to her at present; sometimes more flexibility would have been nice. I did get the feeling she could have eaten the orchestra for breakfast, though. Julia Novikova was a poor Zerbinetta (in fact my third disappointing Zerbinetta in a row–and I am raising my opinion of the first, Kathleen Kim, with each successive effort). Her voice is simply far too small for this role in the Staatsoper, and lacks an incisive cutting quality. The higher notes projected more clearly, but were shrill and thin. Her stage business consisted of the matronly coquetry that was created for and should be the sole property of Edita Gruberova, this production’s Zerbinetta of record. With tiny, youthful, enthusiastic Novikova, the miniature straw hat, twirling of a ruffly umbrella, and literal hand gestures (waves, balancing scales) were like a 14-year old dressed up as her dowdy grandmother, and the effect was cloying. Elsewhere, Stephanie Houtzeel seems to have Straussian style. But her voice, despite considerable volume, lacks substance and depth, all vibrato and no core. I’ve pretty much given up on hearing decent Bacchuses–Botha excepted–and Burkhard Fritz proved no exception, which muffled, underpowered tone. 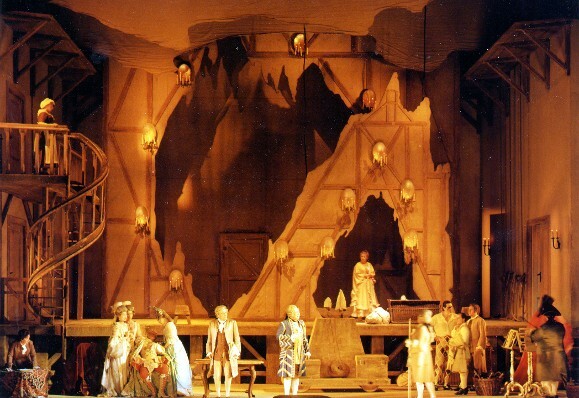 Some smaller roles were better, notably veteran Wolfgang Bankl’s clearly enunciated Musiklehrer and Staatsoper debutant Daniel Schmutzhard’s solid Harlekin. The Nymphs were a bit unblended. They and the Commedia folks hit their blocking marks well enough, but the stretch between Zerbinetta’s aria and Bacchus’s appearance felt interminable. The presence of incoming Salzburger Festspiele intendant Alexander Pereira in the spoken role of the Haushofmeister was pure stunt casting. He’s no actor, but I actually enjoyed this part played without the usual insufferable archness. His delivery of the dictum that the comedy and tragedy would be combined was rather funny, clearly coming from a dumbass who has convinced himself that this is the best idea in the world. Maybe I have overly high standards for this opera but I’m pretty sure that this one was not, for the most part, any good. Oh well, kam die neue Ariadne gegangen, hingegeben war ich nie stumm. Several performances remain: 7, 9, 12 March. Its a good thing you're holding up Zerbinetta's end because poor little Misses Kim and Novikova seem to have had difficulty doing same. You do appear to be on the same wavelength as the locals, right up to you're less than completely ecstatic reception of La Stemme – its hard for Ariadne not to be borrrrrrrrrrrring but her PD/A at the Met last year was not only beautifully sung but downright exciting. I would still think tho that her appearance must be one of the highlights of the Viennese operatic year. As heard recently she is still in all respects quite thrilling and with all those Brunnhilde's coming up (damn I wish I could hear one) one must see her as much as possible because there's bound to be some wear and tear. I also heard Fritz as a somewhat serviceable Florestan a couple of weeks ago a role that has quite a bit in common with Bacchaus actually. Acting-wise I actually would put Mari Erismoen of the Kupfer production first, she was the only one I didn't want to smack, Kim first vocally. But none of the three were really satisfying. It surprises me that my review is the same as the deutschsprachige people's (which I haven't looked at yet), because there was LOTS of applause for Novikova et al. I feel awful saying this but it was way more than was deserved. I wish I could hear Stemme as Brünnhilde too. Oh, was that the Gatti Fidelio you mentioned? How did you like it? It was actually a different Fidelio. Gatti's was a strange mixture of beautiful playing and pretty conservative conducting with a few odd choices. Some of the tempos and dynamic contrasts were quite effective but uberhaupt it was a long evening that seemed longer with a mostly OK but not exciting cast. The Floristan, however, really sucked and Fritz's serveceability (not a word – lets germanize into dienstwurdig or something – it'll probably work) was all the more apparent. That performance was also odd and problematic in many ways but had one truly fantastic performance. WAIT! You can't say there was one truly fantastic performance and then not say whose it was!! !